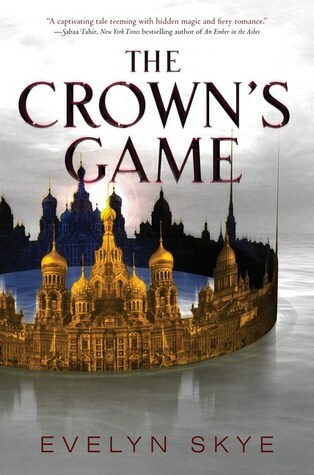 The Crown's Game by Evelyn Skye. Balzer + Bray, 2016. Ebook. 399 pages. I had seen a lot of mixed review for The Crown's Game prior to picking it up, which made me wary, but I have to say that I was very pleasantly surprised with how much I ended up enjoying this book. The Crown's Game is an extremely well-written, atmospheric story that is rich in detail, culture, and vivid descriptions. While The Crown's Game has an interesting premise, the plotline of having a brutal competition in which competitors may die during or after the competition is not altogether unheard or uncommon in recent books (for example: Three Dark Crowns, An Ember in the Ashes, Throne of Glass, etc.). Evelyn Skye, however, seemed to breathe a bit of fresh air into this idea by developing a unique, refreshing story that I found really exciting. I loved the characters Skye brought into the mix, and I paritcularly enjoyed how distinct each of their personalities were. The POV alternates between the three main characters - Vika, Nikolai, and Pasha (does anyone else picture a big teddy bear of some sort when they see the name Pasha? No? Okay.) - whom I will discuss individually. Vika is one of the two enchanters, a fierce young woman who is not the sort to back down from any type of challenge. She's not an in-your-face sort of fierce, but she is definitely a formidable opponent with great strength, both mentally and in regards to her magic. Nikolai is the other enchanter, and although he is just as formidable an opponent as Vika, he is much more reserved and withdrawn than Vika, and I liked that about him. He was very humbled from his upbringing and knowledge of the world around him, which really contributed to his development as a character. Lastly is Pasha, who is by far the most entertaining and humorous of the bunch. Pasha is Tsar's heir, and is thus supposed to take his role and title very seriously, but instead he likes to disguise himself as someone else and sneak off to do 'normal' things. As far as the narrations go, however, Pasha's seemed the weakest. Don't get me wrong, I loved him as a character, but his narration just felt the most unpolished out of the three of them. I think that what made this 'game' premise so successful was the fact that it wasn't inherently violent at all. It was all about the magical skills of each enchanter, and while this could result in lackluster entertainment, it didn't. I loved the beautiful ways in which Vika and Nikolai crafted their magic and attempted to impress the tsar. I loved the mixture of fantasy and historical fiction. And everything was so Russian. I know that might sound silly to say, but it's true. Skye really put a lot of effort into research, and it pays off. The culture, the language, the setting - everything was really well done, and I felt transported to another land. Oh, and have I mentioned the food? So many delicious bakery and food descriptions... I was in heaven. Out of the many positive things I have said about this book, the main negative point I found was that the feelings between some of the characters were a bit too speedy or unrealistic for me. Emotions seemed too strong too soon, and that is the main thing that dragged me back out of the story. Overall, I am giving The Crown's Game four stars! This wasn't necessarily a groundbreaking book by any means, but it was certainly entertaining and provided a great deal of food for thought. I loved the setting and plot and characters, and I would definitely recommend it. I adore this book, so I'm glad you enjoyed it as well. The second book is INTENSE, so I hope you will continue on and finish the series :) Awesome review!